Before Sony and Nintendo waged the great, terrible console war of the mid-’90s, the two companies had partnered to bring a CD-ROM to the Super NES. It was intended to be released in two forms: an add-on that SNES owners would jam into their existing consoles and a new hybrid machine that played both CDs and SNES cartridges called the PlayStation. 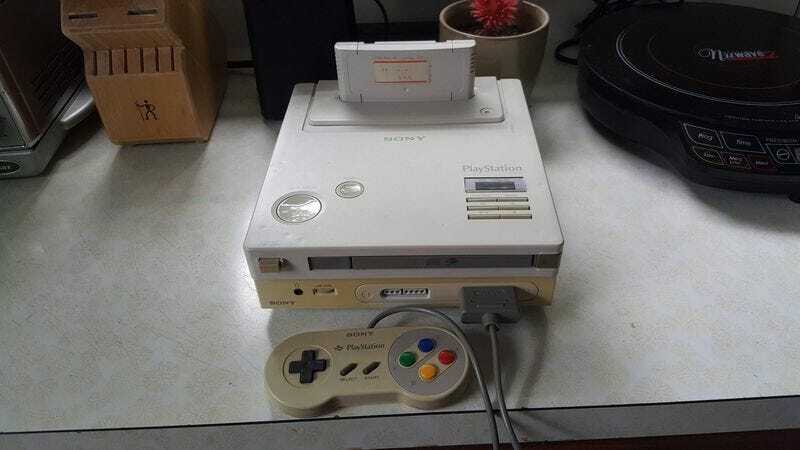 The tenuous corporate alliance collapsed before Sony’s new device reached store shelves, and while the company would eventually release the PlayStation we know and love, that unreleased hybrid, now often referred to as the “Nintendo PlayStation,” became the stuff of legend. So it was huge news last year when Terry and Dan Diebold found the only known prototype console packed away in a box of junk Terry had bought in an auction for $75. And the thing actually worked—to an extent. The Diebolds found a way to make it play Super NES cartridges, but the CD drive was busted and the games played without sound. Now, their quest to get this mythical marvel of video game history running has led to Ben Heck, who’s famous for hacking and modifying consoles. Heck tore the machine apart, explored its guts, and tried his damnedest to rebuild it, and lucky for us, it’s all been documented across two fascinating episodes of his YouTube show. The teardown in part one is a bit terrifying to watch, as Heck pulls this priceless artifact apart and takes stock of all the hardware that’s inside. After getting a better idea of the thing’s capabilities, he even stacks it up against its CD-ROM-toting contemporaries, the Sega CD and the TurboGrafx-CD. The second video (embedded above) is where things get even more interesting. With the prototype’s faults and guts in mind, Heck sets out to get the system up and running again. The CD drive proves to be the real issue, but in the end, he gets it spinning and the console attempting to read it. All it took was removing a single wire that was put in place to stop the drive from working and replacing a few electrolytic capacitors, little nodules that are often the culprit when older electronics die. So we finally know the Nintendo PlayStation is real and now, thanks to Heck, the only known unit in the world should be working fine. There’s just one issue: Since the thing never made it to market, there aren’t any SNES CD-ROM games that could be used to test the drive. Whether the system’s owners find a game disc in another box of junk or some handy home developers cook up a test CD, hopefully the next time we see the Nintendo PlayStation in action this puppy will be living up to its full potential.